There are so many reasons to love gallery walls that it’s hard to choose just one. From an art lover’s perspective, there’s just something irresistible about showcasing so much of your collection in one group, The end result will say a lot about you—and to you. For the room designer, a gallery wall can be the answer to many of the challenges a room a might pose. If you’ve got a lot of wall space to fill, don’t shy away from using larger framed pieces. 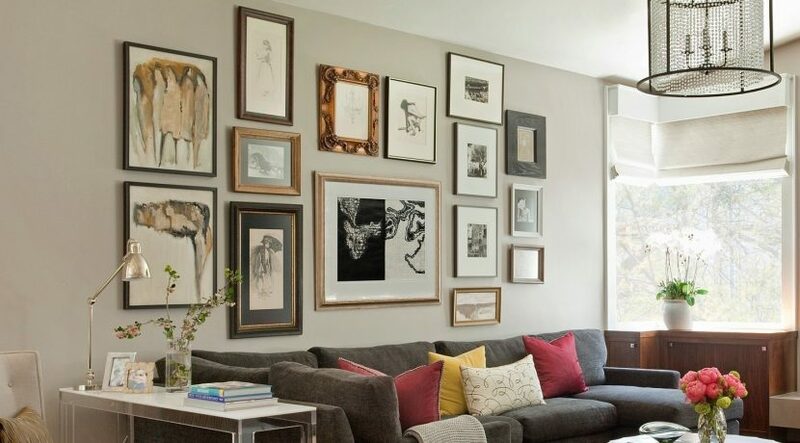 Gallery walls come in all shapes and sizes, so rather than going with an undersized assortment that doesn’t get the job done or trying to fill the space with dozens of smaller frames, create an arrangement of larger pieces. This will provide you with the art area you need while keeping the work of hanging it to a manageable level. For art lovers whose collections are too large to contain on just one wall, why not use two? The gallery wall is an inspired way to create a room full of color, pattern, and energy. Even though they’re often referred to as “art walls,” one of the most important things to remember when constructing a gallery wall is that they can contain more than just framed works of art. Other interesting wall-mounted pieces, such as antlers or even lamps, can play a role in your gallery wall. It’s one of the biggest questions that all designers eventually have to face—what are we supposed to do with the television? If that’s an issue that has ever perplexed you as a home designer, consider giving this option a try. In the age of wall-mounted televisions, there’s absolutely no reason why your TV can’t double as wall art. Size matters when it comes to gallery walls—or more specifically, sizes matter. Whether you’re working with just a few pieces or filling an entire wall, one of the most important things you can do is to vary the sizes of the artworks. In a colorful space, a colorful gallery wall is a must. A gallery wall isn’t just a great way to add color—sometimes it’s the best way to break up large blocks of bold color. The beautiful blue wall that dominates space might be too overwhelming if not for the equally colorful gallery wall that both complements and tames the bold wall. Gallery walls aren’t just for living rooms and bedrooms. Take your art to an unexpected place and create a gallery wall somewhere new. For a mesmerizing wall display, pair bright colors with strong patterns. When using this method in a space with neutral walls, look for pieces that have a lot of negative space. This will allow the gallery wall to echo both the vibrant color story of the furnishings, as well as the neutral story of the wall—all at the same time. A gallery wall is a wonderful way to not only showcase your taste in art but to pick up on themes in the room as well.